We love being part of a digital age that allows us to connect with teachers across the world via Blogs, Twitter, and Facebook. Besides the many notes of support and thanks sent our way, we also receive lots of questions sent by teachers who are constantly exploring ways to improve their practice in order to help their students become more knowledgeable and independent each and every day. This week’s blog attempts to answer some of these questions in the hope that these could be useful to most teachers out there in the world. Our thanks to all of your for your continued passion and commitment to what matters most – our students! It can be hard to balance the many demands placed on us as teachers. When it comes to charts, we have one clear answer: charts are for students first and foremost and be wary to clutter them with things children do not need. Something like an essential question can be posted in the same area as the charts. If it is an over-arching central question, then it can go on its own small paper using shared or interactive writing to compose it. Essential questions are what our teaching (and our charts) strive to help children answer, so having that posted and clear is helpful. As for learning targets, those goals are often what inspire the headings on any one chart. If you have a learning target to help students write with sight words, spaces, and most sounds represented by a letter, then the chart heading will address that target: “I can write in an easy to read way!” and the bullets underneath address the specific ways to do that. You can always go to your administrator to show the ways you are co-constructing meaning and purpose with your students on your charts! If your administrator wants it written in fancy teacher language, you can always post a small sign outside your doorway which conveys this information to the adults entering the room. This will help clarify the difference between communications helpful to adults and communications helpful to children. The chart below makes it very clear the focus being studied in this class. Using the title of a current unit of study is one way to satisfy an area that is often a “look for” when administrators visit a classroom. The heading makes it clear what is being studied and the arrows help reinforce the ongoing process. How do I order the e-book version of Smarter Charts? It can be ordered directly from Heinemann.com. To get it on an iPad you just have to download “Bluefire Reader” a free app. If there is one thing we have learned since the publication of Smarter Charts, it is that the principals of good charting hold true regardless of the grade or the age of the students. This is because the principals are based not only on educational pedagogy, but on brain science, design theory, and advertising results; all having the overarching goal that information be presented efficiently and effectively in order to see results. The result we are all after is that what we are teaching (or selling) is remembered and used long after it has been taught (or sold). What this means on a very basic level is that the effectiveness of a chart is directly related to its accessibility and its impact or use by the learner. What we sometimes see on charts as we travel up the grades is an increase of print and a decrease of visuals. There is very little research that supports this trend. All learning is aided by visuals. John Medina (Brain Rules, 2008) did studies where he gave adults a written text and found that 72 hours later they recalled 10% of the information, but when he added visuals participants recalled 65% after 72 hours. Below is a middle school chart created to support writing from an upcoming Middle School units of study book (Calkins, Ehrenworth, Minor, 2014). The visuals were carefully considered and only added to make the text more memorable. They were not added as mere decoration or to make the chart look pretty. The visuals incorporated were added to trigger students’ memory of the steps or the strategies they could draw upon if stuck or if they forgot what to do, efficiently and effectively. With use these strategies will become internalized and the chart will no longer be needed. 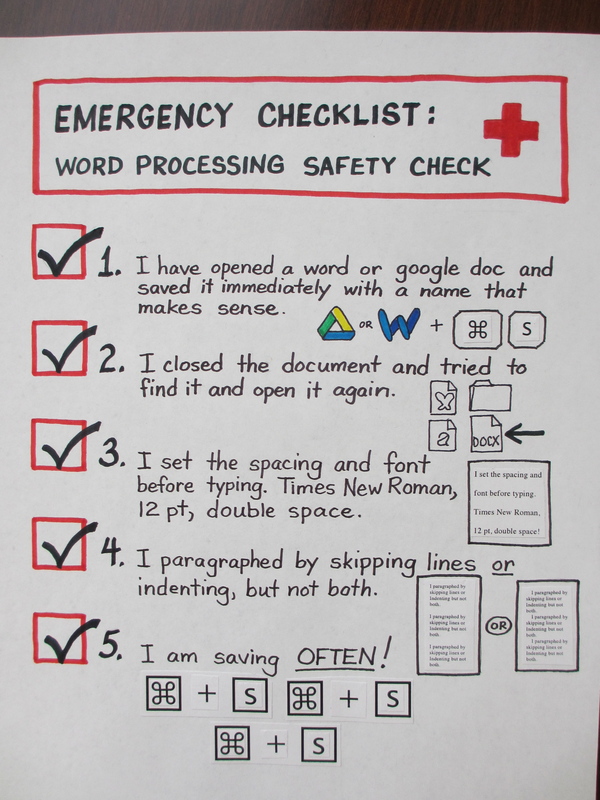 This editing checklist reminds students of critical points to attend to as they ready their pieces for publication. I am interested in having my students participate more in the chart making. Right now they do a lot of suggesting in terms of content, illustrations, etc. But I think having their handwriting will make it more authentic and engaging. Suggestions/advice? 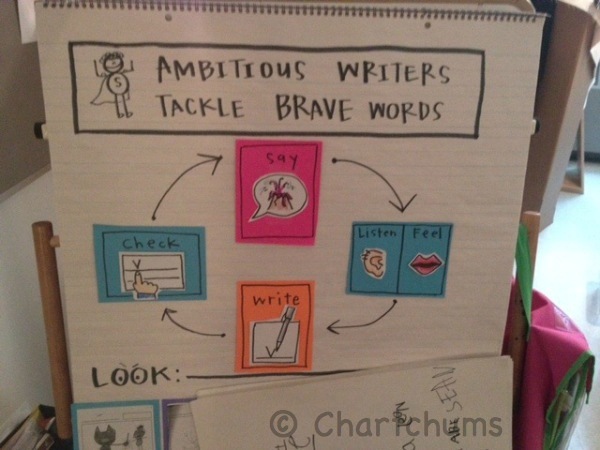 One idea is to create the chart through interactive writing where kids share the pen with you. This works well when you want the children to participate in the composition of the chart, have the kids’ hands show, but also want the conventions correct because the chart will be hanging up in the room as a model. You can also ask kids to make drawings to add to the chart or include copies of their work. This also contributes to students feeling empowered and known as those who can and do. Kids are drawn to emulate their classmates and quickly get the message that the classroom is full of teachers and models we can learn from. 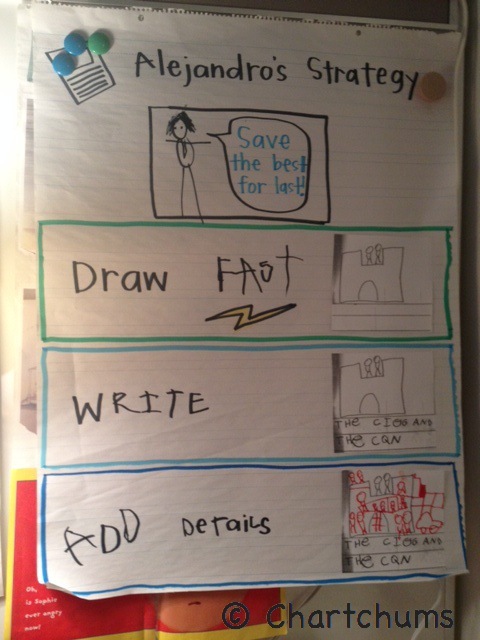 The chart below was written with students in Kristi’s classroom using interactive writing to highlight one student’s strategy for writing. Not only does the chart involve the students, but it makes a student famous by naming the strategy after him. Alejandro’s strategy is shared for all to try. How can we arrange for you to come to our school/district to present a PD day on charting? We are available for full day author visits. You can contact Kathy Neville at Kathy@readingandwritingproject.com for pricing and availability. We hope these questions and answers help provide some direction and spark further ideas as to the many ways we can use charts to help our students learn what we are teaching, help themselves help themselves, and provide guidelines that will aid in developing realistic goals. Keep your questions coming and share your charting insights and solutions as well, so we can share again in the future.